It's been approximately 18 months since I was hitting up the gym a good handful of times a week. 18 months. That's a very long time - and my thighs have not thanked me for it! I left as the gym I was attending just wasn't for me - too posey and full of burley, muscular men showing off in the weights area. Lame. Plus, I had been wanting out for some time as it was simply too expensive (and I was on student deal at the time), I wasn't finding the time or energy to go and I had to stay a member with them for a whole year before I could leave. Once the year was up, it was bye bye from the gym and bye bye from exercise for some time. Of course, I was walking 1.5 miles to and from work and running around on my feet all day at work. However, my body just ended up plateauing and was just used to my daily movements, and I wasn't 'compensating' my diet for the lack of exercise I felt I was doing. I spent these 18 months however feeling relatively sluggish and generally quite down about my overall body image. Everything has become a little soft and appeared much less toned, my thighs have expanded to a size to rival a elephant's and my fitness levels have reduced dramatically. I've dabbled with at-home workouts and in all honesty, unless you have an enormous space to do it in they simply are not feasible. I wrote a post about Fitness Anxiety a few months ago now and it feels so good to have finally hit those anxious feelings on the head, now that I've joined a new gym. So what am I doing differently this time? Depending on where you are on your fitness journey, setting yourself a monthly target is a good way to ensure you're always pushing yourself. For the beginning of the year, I'm simply setting my targets as 'attend the gym x time a week' and upping these sessions by one as each month goes by. So, for the time being I'm telling myself I must go twice a week minimum. Only twice, because that's currently very much an achievable goal. Any more times per week is a bonus. That's a good way of looking at your goals too - if you can push yourself slightly further than your current goal, that's something to be celebrated and will hopefully mean come next month's goal, it'll be a little easier to fall into. It's easy to simply join a gym or start going for a run and fall into a safety zone of doing the exact same thing each time. The exact same routine of treadmill, free weights and stretching, or the exact same route you run each week. Changing things up every once in a while is always a good idea, such as on Monday's you focus on HIIT training, Tuesday's you do full body weight training, Wednesday's you focus on stretching and a Pilates-esque workout, and so on. For the time being, I need to build back my confidence so simply want to attend classes until I feel I'm 'ready' to do my own thing in the main gym. Last week I enjoyed a mix of Body Balance (at 7am!!) and Body Pump (my body is only just starting to feel like it's working again - I felt broken for the whole weekend!). It feels rather old fashioned to continuously weigh yourself until you reach a 'goal' weight. Trust me, you may one day get to that goal number but you won't feel any different, if anything there's a good chance you may feel worse and want to lose more weight - so snap out of that habit! Instead I think taking photos of yourself on a regular basis - feet together, no breathing in! - is a good idea, as is taking measurements. When your clothes start to feel a little looser is always a sign that some progress is being made, and seeing before and after images can be a huge motivation. There are so many fitness accounts on Instagram that track the progress of their clients with before and after images to inspire others and it's always incredible when you see the difference! I used to be hopeless and wouldn't properly feed my body for quite some time after my workouts as I would be too busy procrastinating and spending my student loan in Topshop and Space NK, rather than heading home, feeding my body and doing lots of Uni work. Oops. You don't need to have a huge meal before and after your workout but simply having some energising and protein filled snacks to hand is always an idea. I love these new Wild Thing* bars to give my body some energy prior to my workouts, as they offer a good balance of nutrients, carbs, fats and protein with the blend of fruit and nuts. If you find Nakd bars are a little too un-substantial, you might like these as the nuts aren't totally blitzed up and the crunch of the whole nuts feels a little more filling - somehow! A handful of nuts or a green smoothie with a scoop of plant based protein powder is a good way to care for your body post-workout, and quickly too! I'm never going to be Rosie Huntington-Whitely. Never. I can wear her lingerie (range! ), her make-up and try and get my hair and wardrobe to be like hers but at the end of the day, she's the supermodel and I'm Lucy. It's easy to compare yourself to others online but many of these models, actresses, singers, personalities, bloggers and social media stars are paid to look the way they do. They can afford personal trainers, chefs, nutritionists, stylists and so on at their beck and call. You also have to take into account that some people simply have the luck of the gene pool! It's easy when you're new to the fitness world to compare yourself to other people in classes and on the next treadmill and whilst they may seem super fit and better than you, you have to remember that everyone starts somewhere and they were in your shoes once upon a time too. Keep your head forward, take no notice of what others are doing or how they're looking and enjoy your new fitness journey! 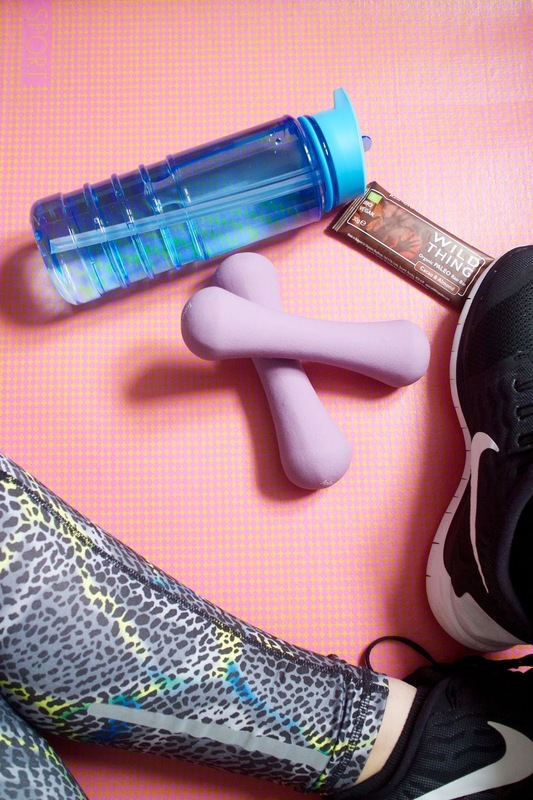 What tips do you have for returning to fitness after a break? What are your favourite pre and post workout snacks? What's your current fitness goal? Great post :-) totally agree with everything you said!